It's easy to walk your dog on a leash with the KeepSafeBreak-Away Collar. Simply attach the leash to both D-rings to disengage the break-away buckle. 4 or 6 feet in length 3/4" wide, with easy swivel snap. 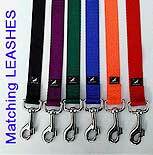 Get matching reflective leashes to go with your reflective collar. A great combination to keep your dog safe at night! The reflective strip on this leash will reflect car lights and glows in the dark after being exposed to light. Nite Lites Reflects lights from cars and glows in the dark after being exposed to light. Your evening strolls just got safer.